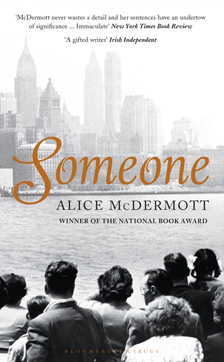 Alice McDermott’s latest novel Someone is a resonant study of an Irish-American family and its remarkable matriarch, and of changing lives and landscapes in 20th-century Brooklyn. Her first novel in seven years, it is her third to have been longlisted for the prestigious National Book Award. I’m at my desk, which is against a window that looks into my backyard. It’s a very suburban backyard: grass, tall trees, a stone wall, but at the moment it is high autumn and the ground is covered in bronze and red and yellow leaves and because there is a wind, more leaves are steadily falling and in just the past few minutes a mob of black starlings has invaded the scene. They are raucous and loud and delighted, it seems, to be travelling together in this mad crowd – there’s something wonderfully adolescent about their volume and their agitation, and the way they mimic, in black, the swirl of leaves. Now they’re moving on. Sort of astonishing, these little theatricals – nature putting on a show whether any one of us is watching or not – even in a suburban backyard. Breakfast and a few cups of coffee. Also my pre-getting-through-the day ritual. Full-time four days a week and the occasional weekend. Both. Sometimes one first, sometimes the other. I don’t know. I don’t feel the need to relax when I’m writing. Not writing is what makes me tense. Or maybe writing is my way of relaxing. How would you describe your latest book in up to 25 words? One woman trying to make some order out of her long life – looking all the while for whatever revelatory light shines through the quotidian. No one, when I can get away with it. My agent and my editor when professional considerations require. I can’t imagine wanting to create someone else’s character. I’d rather receive the character fully formed, as a reader receives a character, rather than wish to have gone through all the travail it took the writer to breathe life into an Ahab or a Mrs Ramsay or an Emma Bovary. Impossible to say I have a favourite. The ideal is not to have a favourite, it seems to me, it’s to have access to the lines of dialogue, poetry, prose you need, or love, at any given time. Sometimes you need Yeats and sometimes you need Auden, or Plath, or Muldoon or Bishop. Sometimes you need Nabokov, sometimes Flannery O’Connor, sometimes Borges, sometimes Morrison or Munro or Faulkner or Dickens. I’m afraid I’m going to demur again – see question 10. Among the recently-published: Claire Messud’s The Woman Upstairs, Mary Kay Zuravleff’s Man Alive, Colum McCann’s Transatlantic. Among the new-to-me, Stoner by John Williams and Independent People by Halldór Laxness. Among the re-reads, All the King’s Men by Robert Penn Warren. Seamus Heaney’s poems and Tess of the D’Urbervilles. And Measure for Measure because I recently saw it staged. Tess of the D’Urbervilles – but I’m working on it. Have I mentioned yet my reluctance to assign rank to literary works? Independent People from the Icelandic. The Collected Stories of Vladimir Nabokov. Alice Munro’s Selected Stories. John McGahern’s too. A number of galleys are piled on the floor of my office – neglected while I’ve been on a book tour and teaching a graduate class at Johns Hopkins University. When the semester is over, I will happily begin opening them, hoping to discover something wonderful. And my husband wants me to read Brave Genius by Sean Carroll. The subtitle is: A Scientist, a Philosopher, and Their Daring Adventures from the French Resistance to the Nobel Prize. So that will be my dose of non-fiction for the New Year. Eudora Welty, Grace Paley, Flannery O’Connor, Maeve Brennan – a small gathering of witty grandes dames who have seen the other side. Wouldn’t that be fun? Looking out the window at my enchanting suburban backyard. 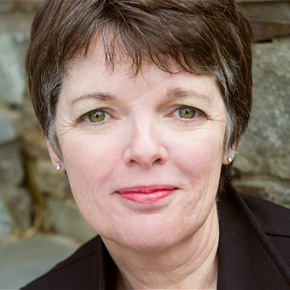 Alice McDermott is the author of seven novels including After This, Charming Billy (winner of the 1998 National Book Award and A Bigamist’s Daughter. She has been a finalist for the Pulitzer Prize three times and has also been nominated for the Los Angeles Times Book Prize and the PEN/Faulkner Award. She lives with her family outside Washington DC. Someone is published by Bloomsbury Circus in hardback and eBook. Read more.